In a recently published interview from late last year with 4Gamer (via Siliconera), Drakengard's series director Taro Yoko reflected on 2013 and 2014. Last year was probably busy. This year? Less so. "I'd like to say thank you very much for the year 2013 to everyone," said Yoko, who's known for his honesty. "Living can be pretty tough. By the time this comment is published, I believe that Drakengard 3 will have been safely released." Yoko added, "Next year, I'll be going back to unemployment, so I don't have anything as far as a next title goes, but as I sit here and mope, I hope everyone has a great and fun 2014. That is all." On Twitter, Yoko said he wants to make Drakengard 4 but added that he cannot kickstart the project because Square Enix owns Drakengard. However, he hopes to eventually make a spin-off. 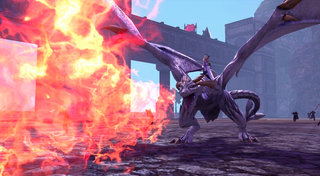 Drakengard 3 is slated for a 2014 release in the West. Chin up, Yoko!